^ Huxley, T.H. On the animals which are most nearly intermediate between birds and reptiles. Annals and Magazine of Natural History. 1868, 2: 66–75. ^ （英文） Heilmann, Gerhard. The Origin of Birds. London: Witherby. 1926: 208pp. ^ 4.0 4.1 4.2 4.3 （英文）Padian, K. (2004). Basal Avialae. In: Weishampel, D.B., Dodson, P., and Osmólska, H. (eds.). The Dinosauria（second edition）. University of California Press:Berkeley, 210–231. ISBN 978-0-520-24209-8. ^ （英文） Osborn, Henry Fairfield. Three new Theropoda, Protoceratops zone, central Mongolia (pdf). American Museum Novitates. 1924, 144: 1–12. 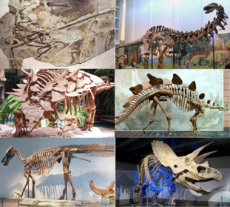 ^ Paul, Gregory S. A Quick History of Dinosaur Art. (编) Paul, Gregory S. (ed.). The Scientific American Book of Dinosaurs. New York: St. Martin's Press. 2000: 107–112. ISBN 0-312-26226-4. ^ （英文） Ostrom, John H. The ancestry of birds. Nature. 1973, 242 (5393): 136. doi:10.1038/242136a0. ^ （英文） Gauthier, Jacques. Saurischian monophyly and the origin of birds. (编) Padian, Kevin. (ed.). The Origin of Birds and the Evolution of Flight. Memoirs of the California Academy of Sciences 8. 1986: 1–55. 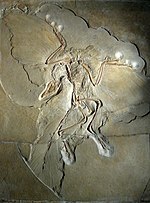 ^ （英文） Wellnhofer, P. Ein neuer Exemplar von Archaeopteryx. Archaeopteryx. 1988, 6: 1–30. ^ （英文） Xu X.; Norell, M.A. ; Kuang X.; Wang X.; Zhao Q.; and Jia C. Basal tyrannosauroids from China and evidence for protofeathers in tyrannosauroids. Nature. 2004, 431 (7009): 680–684. PMID 15470426. ^ （俄文）Kurzanov, S.M. (1987). "Avimimidae and the problem of the origin of birds." Transactions of the Joint Soviet-Mongolian Paleontological Expedition, 31: 5-92. ^ Ortega F., Escaso, F. and Sanz, J.L. A bizarre, humped Carcharodontosauria (Theropoda) from the Lower Cretaceous of Spain. Nature. 2010, (467): 203–6. doi:10.1038/nature09181. ^ （英文） Grellet-Tinner, Gerard. Oology And The Evolution Of Thermophysiology In Saurischian Dinosaurs: Homeotherm And Endotherm Deinonychosaurians?. Papeis Avulsos de Zoologia. 2006, 46 (1): 1–10. ^ Xu and Norell, (2004). "A new troodontid dinosaur from China with avian-like sleeping posture." Nature, 431: 838-841. ^ Edwin H. Colbert, Dinosaurs, Hutchinson & Co. Ltd, 1962, p. 188). ^ V. Perrichot, L. Marion, D. Neraudeau, R. Vullo and P. Tafforeau, The early evolution of feathers: fossil evidence from Cretaceous amber of France. Proceedings of the Royal Society of London B 275, 1197-1202 (2008). 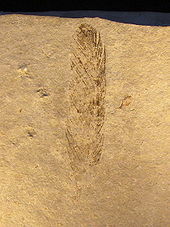 ^ Jerzy Dzik; Tomasz Sulej; Grzegorz Nied wiedz, Possible link connecting reptilian scales with avian feathers from the early Late Jurassic of Kazakstan. Historical Biology, Volume 22, Issue 4 December 2010 , pages 394 - 402. ^ （英文） Mayr, G., Pohl, B. and Peters, D.S. A Well-Preserved Archaeopteryx Specimen with Theropod Features. Science. 2005, 310 (5753): 1483–1486. doi:10.1126/science.1120331. ^ （英文） Martin, Larry D. A basal archosaurian origin for birds. Acta Zoologica Sinica. 2006, 50 (6): 977–990. ^ 29.0 29.1 （英文） Feduccia, A. Birds are dinosaurs: simple answer to a complex problem. The Auk. 2002, 119: 1187–1201. ^ （英文） Lingham-Soliar, T. The dinosaurian origin of feathers: perspectives from dolphin (Cetacea) collagen fibers. Naturwissenschaften. 2003, 90 (12): 563–567. PMID 14676953. ^ （英文） Prum, Richard O. Are Current Critiques Of The Theropod Origin Of Birds Science? Rebuttal To Feduccia 2002. The Auk. April 2003, 120 (2): 550–61. ^ 34.0 34.1 Zhang, F., Kearns, S.L., Orr, P.J., Benton, M.J., Zhou, Z., Johnson, D., Xu, X. and Wang, X. (In press). "Fossilized melanosomes and the colour of Cretaceous dinosaurs and birds." Nature, advanced online publication, 27 January 2010. ^ Sloan, Chris. Dinosaur True Colors Revealed for First Time. National Geographic Magazine. 2010-01-27 [2010-01-29]. ^ Lingham-Soliar T, Plodowski G. The integument of Psittacosaurus from Liaoning Province, China: taphonomy, epidermal patterns and color of a ceratopsian dinosaur.. Naturwissenschaften. 2010 May;97(5):479-86. 2010-03-31 [2010-03-31]. ^ Transcript: The Dinosaur that Fooled the World. BBC. [2006-12-22]. ^ 40.0 40.1 Prum, R. & Brush A.H. The evolutionary origin and diversification of feathers. The Quarterly Review of Biology. 2002, 77: 261–295. doi:10.1086/341993. ^ Mayr, G. Peters, S.D. Plodowski, G. Vogel, O. Bristle-like integumentary structures at the tail of the horned dinosaur Psittacosaurus. Naturwissenschaften. 2002, 89: 361–365. doi:10.1007/s00114-002-0339-6. ^ Xu, X., Zheng, X. & You, H. "Exceptional dinosaur fossils show ontogenetic development of early feathers" Nature 464, 1338-1341 (29 April 2010) ). ^ Longrich, N. (2002). "Systematics of Sinosauropteryx." Journal of Vertebrate Paleontology, 22(3): 80A. DinoBuzz，dinosaur-bird controversy explained, by UC Berkeley. Journal of Dinosaur Paleontology，with many articles on dinosaur-bird links.